India’s football international against Kenya on Monday sold out in hours following captain Sunil Chhetri’s emotional plea for fans to support the team after barely 2,500 people turned up to watch them play last week. India match sells out after emotional plea by captain ByAfp Published: 08:37 EDT, 4 June 2018 | Updated: 08:37 EDT, 4 June 2018Chhetri’s heartfelt appeal went viral on social media, prompting fans to shell out for ticketsIndia’s football international against Kenya on Monday sold out in hours following captain Sunil Chhetri’s emotional plea for fans to support the team after barely 2,500 people turned up to watch them play last week. Chhetri’s heartfelt appeal — backed by India’s cricket heroes Virat Kohli and Sachin Tendulkar — went viral on social media, prompting fans to shell out for tickets. Every seat in the 15,000-capacity Mumbai Football Arena was quickly sold with one fan buying more than 1,000 tickets for the Intercontinental Cup game. 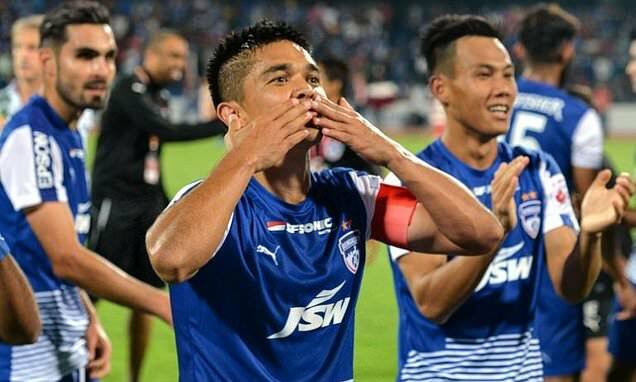 The disheartened Chhetri, who scored a hat-trick in the match, said in a Twitter video: “To everyone who has lost hope in Indian football I request you to come and watch us in the stadiums. A popular Mumbai social media commentator, Nikunj Lotia, said he had booked an entire stand for the game which will be Chhetri’s 100th international.